20ct., Winchester, 7.62x54R cal. 175gr. FMJ NICKEL ammo. Manufactured in the U.S.A. by Deuce 45's, Inc. The cases are factory, Nickel, boxer primed and fully reloadable. 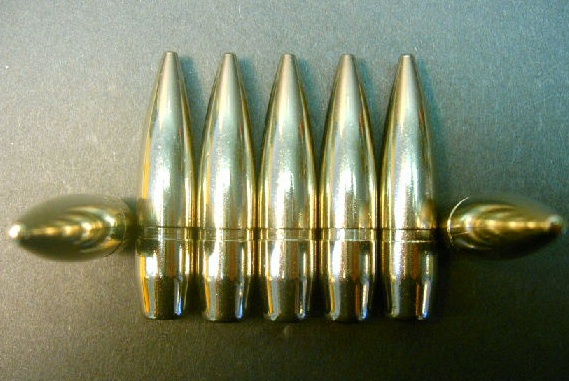 The bullets are factory Nickel and have an interesting, two section design (see sectioned bullet in the picture). 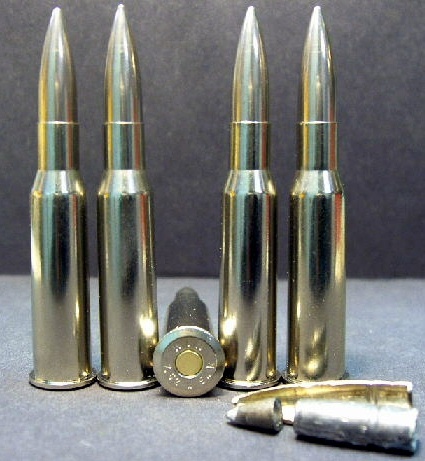 The bullets have a nickel jacket and a lead core in the rear of the bullet but a non-magnetic, seperate tip in the nose of the bullet. The tip is non-magnetic and harder than the lead but not excessively (most likely aluminum). Since Winchester rarely ever manufactures nickel cases or bullets in any caliber even for the U.S. military (and especially not in foreign military calibers) the components used in this ammo are very rare! We have only a limited amount so don't miss this chance to get some one-of-a-kind ammo for yourself. Ammo comes packaged in a plastic, vacuum sealed pack.